Photograph of group (committee) at ? 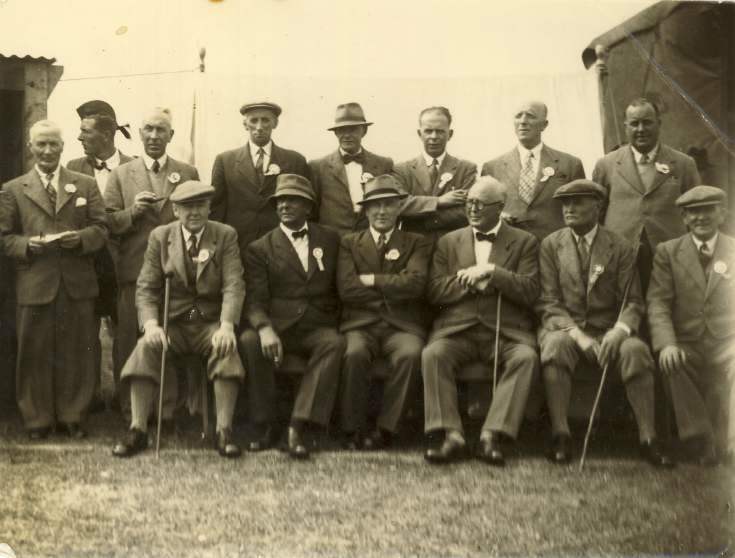 Sutherland Agricultural Show or Dornoch Games: back row, Bill Bremner, Ted Brannen (County Architect), Charlie McHardy, W.G. McIntosh (Pitgrudy), W. Skinner (Town Clerk), Capt. Bob Grant, ?name unkown; front row, Major Rutherford, Willie Hugh Innes (donor's, John Innes, father-in-law), John MacLean (Bank of Scotland manager), Hector Ross (Sutherland Arms Hotel), ?estate owner/Paynter, Suisgill, William Macdonald (Sander Macdonald's father). We are sure that the gentleman rear left is William Calder Bremner, cabinet maker and photographer, whose shop was 3 Church Street Dornoch in 1906. Father of Donnie Bremner born 1908 and late of Camore.